I didn't faint and hopefully I’ll be able to use my arms again sometime this week. I did, however, make it to the top of a bouldering course. My day at the Regina Climbing Centre began when I entered the gym on Saturday morning alongside a group of young children there to celebrate a birthday party. I was nervous, but if the kids were there to have a good time, so was I. I'm pleased to say I only let my intense fear of heights partially hold me back. After signing an electronic waiver, climbers are provided with a harness and climbing shoes (unless you are serious enough to have your own). The shoes were tight and like nothing I had ever worn before. Owner Jordan Mackay said my toes should "touch but not scrunch." The shoes for purchase are more aggressive, allowing the wearer to wedge their foot into tighter spots and even hang by the toes. There are four professional rock climbing instructors at the facility who teach each newcomer the guidelines according to the Climbing Wall Association. Mackay took me and my climbing partner through the introductory class, which he said offers enough information to prepare participants for outdoor climbing. "We're really hoping people fall in love with the sport and that we're giving you the habits to be safe and that will take you outside if that's where you want to go," Mackay said. The gym has top roping, auto belays, lead climbing, a bouldering area and a speed wall. We were introduced to some aspect of each, starting with a crash course in knot tying, followed by how-to-belay-without-letting-your-partner-crash-and-fall. In top roping, you are harnessed to a rope which is anchored at the top of your climb and back down to your partner, who belays as you go. Neither of us were able to make it to the top of our first route. In fact, being up that high and allowing yourself to fall (although harnessed) takes some getting used to. After a few attempts, we moved on to the auto belay area. The auto belays allow you to climb without a partner. If you fall, the machine kicks in and lets you down to the ground slowly. That's where the speed wall is set up which allows people to race to climb up side-by-side routes and be the first to hit the bell. In 2020, it will appear as an Olympic sport on the world stage for the first time ever. Joining it in the Olympics will be sport climbing and bouldering. Sport climbing, also known as lead climbing, requires participants to quickly determine the best route up a course. The competitor to make it the highest in the time allotted is declared the winner. Bouldering requires competitors to scale different highly challenging climbs, unroped but above padded mats, in the shortest number of attempts. Mackay said to think of every unfinished course as a project you need to work on each time you come in. Right now, he's working on one in the bouldering area that takes him upside down. "Your top might not be the top. Your top might be where you're comfortable getting and then every little bit, bit by bit, you grow more comfortable with A. going up and B. progressing to more difficult climbs as you get stronger and better at climbing," he said. Matthew Pfingstl said every route he tried during his first week stumped him. He's been coming five times a week since and said bouldering, free-climbing without a harness, is now his favourite activity. "It's a physical puzzle is what it is. It's all about technique. The whole time you have to be thinking about your next move or you'll end up in a corner somewhere with nowhere to go. Pfingstl said he began climbing when the gym opened at the beginning of the year and describes his love affair with the sport as an "obsession." "Every day it's something new and you get better and better. And every day there's 25 people cheering you on and telling you how great you've done," he said. "It's a hell of a community here." Twice a week, Pfingstl said his five-year-old Aalayah joins him. "The first time she fell she said she was like, 'I don't want to do this anymore.' Now she can't wait to come here and get on the walls." Aalayah wasn't the youngest one at the gym on Saturday, though. Kathy Grodecki and brought her 8-month-old son along while she and her partner took turns climbing. "It's a wonderful environment because everybody is really accepting and they just let him hang out. We already talk about his first climbing trip," she said. "We look forward to that." 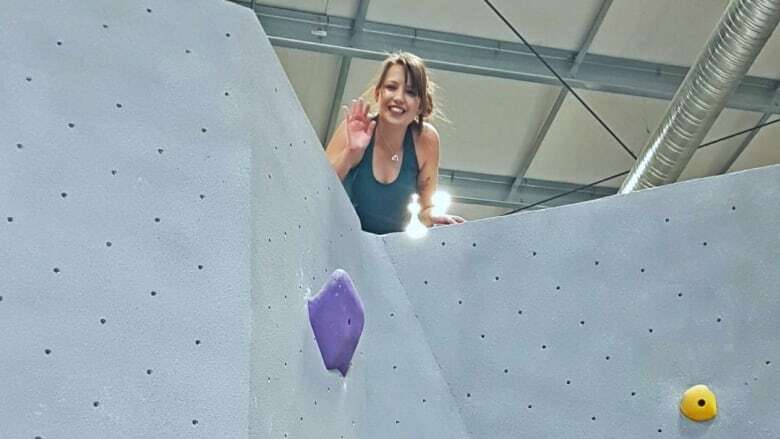 Grodecki said she had been bouldering before, but the new gym has offered vertical climbing to the city. She said she encourages people to ditch their fears and give it a try. "You're not going to get hurt. Every climb you get stronger. If it feels frustrating at first, you just keep going and eventually you'll find success." My climbing partner and I were both able to finish a route in the bouldering section. The experience was worth the physical exertion and hopefully I'll be able to use my arms again sometime this week. With everything said and done, it was lots of fun and I'll likely be back soon to complete my unfinished "project." If you want join in on the growing trend of climbing, the gym is located at 606 B Solomon Crescent. The drop-in price is $16 a day or you can pay $50 per month to become a member.